The health and welfare of animals is one of the cornerstones of AVEC and the European poultry meat sector. Animals are at the heart of our daily work and the foundation of the industry. We are responsible for them, and we believe that it is our duty and credo to ensure their well-being. For many years, animal welfare has been a priority for the European Union. We are world leaders in animal health and welfare in terms of standards and legal regulations. In 2007, the EU passed an EU Council Directive (2007/43/EC) which contained clear guidelines for broilers (chickens kept for meat production). AVEC aims to establish a comparable guideline at the European level for turkeys as well. We do everything we can to keep our animals healthy, and our ultimate goal is disease prevention. 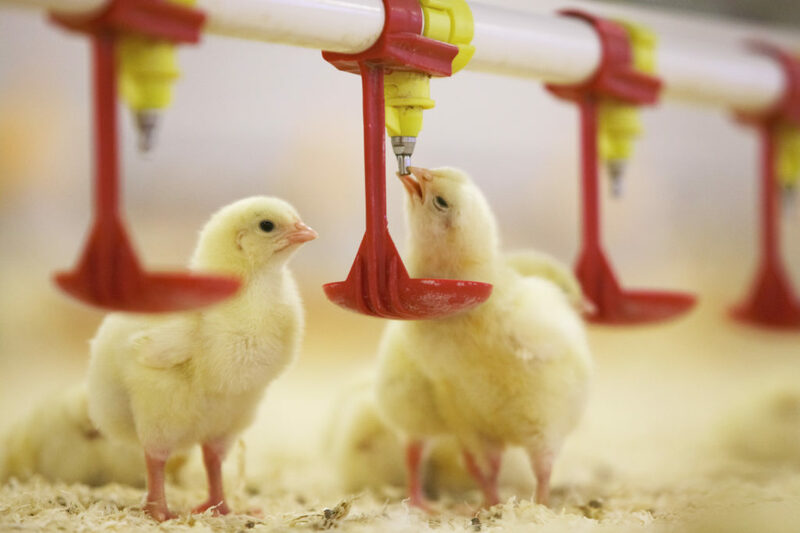 To minimise the risk of disease and to care for livestock effectively, poultry farmers should be experienced and well-trained, and active healthcare protocols should be in place (such as vaccinations and a suitable regimen of nutrients and vitamins). If animals do become ill, they must be treated properly. In some instances, antibiotics may be required to treat bacterial infections. However, in order to minimise and prevent the spread of antimicrobial resistance (AMR), antibiotics should only be administered when necessary and only following a veterinary diagnosis and prescription. AVEC and the European poultry meat sector are committed to promoting the responsible use of antibiotics. We are dedicated to minimising the risk of AMR by keeping the use of antibiotics as low as possible. In recent years, the use of antibiotics in poultry meat production has been significantly reduced across the EU. AVEC is banning the prophylactic use of antibiotics to prevent resistant strains of bacteria developing. Furthermore, the use of antibiotics as performance enhancers has been banned in the EU since 2006. However, there is still work to be done. Discussion and action is needed from politicians and the general public to deal with the threat of antimicrobial resistance. AVEC believes in the ‘One Health’ approach: to improve health and welfare through collaboration and communication between human and veterinary medicine. Animal health and animal welfare now play a major role in genetic selection in poultry farming. Growth and the quick production of breast meat are no longer the sole breeding goals. Health aspects such as fitness, vitality and robustness also play an important role. Growth rates and breast meat were once the main criteria for selective breeding in poultry farming. However, animal health and welfare criteria now also play a key role in genetic selection. Various health aspects like fitness, vitality and robustness are also considered important in selective breeding methods. Avian influenza (AI) poses a serious threat to European poultry stocks. The virus is spread by wild birds, and can affect domestic poultry. The massive outbreak in the winter of 2016/17 highlighted the importance of biosecurity measures to prevent the spread of the virus. AVEC and the European poultry industry are committed to upholding the recognised principles of biosecurity measures to prevent AI viruses from affecting our livestock. Zoonoses are diseases which can spread between animals and humans (such as salmonella, Campylobacter and avian influenza). To prevent and control the spreading of zoonoses, AVEC supports the EU’s ‘farm-to-fork’ principle, which ensures that suitable food safety measures are taken at every step in the production chain. AVEC’s efforts to reduce the spread of salmonella and Campylobacter have been very successful in recent years. When transporting animals to the slaughterhouse, clear legal regulations have been laid down by the EU. Over the past few years, these regulations have been supplemented by so-called ‘best practice’ guidelines. Various technological advances have also been made for transporting and slaughtering poultry. The objective is that animals reach the slaughterhouse unharmed, and only healthy animals are transported. AVEC and the European poultry meat sector are continuously looking for ways to improve animal welfare. However, additional measures and stricter protocols for safeguarding animal welfare are associated with higher costs. In this regard, the consumer plays an important role. The consumer is key for supporting farmers and enabling them to produce in accordance with best practice methods. All of society should work together towards the shared goal of increasing animal welfare, as this is an issue that affects us all.